Founded in 1936, Rapala Lures is one of the oldest players in the game, and their experience and expertise show through in lures that are crafted to be classic and exceptional both in quality and in performance. The Rapala family of products has expanded rapidly, given the popularity of their lures, and now contains reels, knives, rods and reels and other fishing tools, and even clothing and storage. But don’t let their focus on other products fool you. Rapala was founded to build the best traditional fishing lures on the market, and they’ve never once wavered in their drive to create beautiful, functional, and durable lures out of quality materials. And despite their functionality and high quality, these lures won’t break the bank, which makes them great for a new angler who’s looking to build up a quality tackle box, or a more experienced fisherman who’s looking to replace some older, worn out, or lower quality lures. They have a huge lure diversity, too. Crankbaits, jerkbaits, swimbaits, topwater walkers, suspenders, jigs, saltwater-focused lures, and plenty of others make up a lure selection that’s as expansive as it is quality. 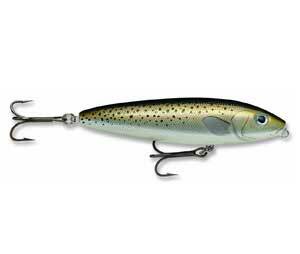 So with so many options out there, you may not know which lures to look at if you’re interested in Rapala’s offerings. Well, you might have guessed it – we’ve put together a list of some of the best and most diverse offerings that Rapala has to offer, and everyone from the greenest, driest fisherman to the most grizzled veterans are sure to learn a thing or two about Rapala lures, what they offer, and which products are right for them. So read on with us, and learn about Rapala and their products. You might just find something that catches your eye. 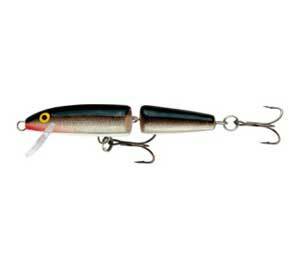 The Rapala Original Floater 05 Brings incredible topwater fishing performance at a low price. Its balsa wood construction provides a lightweight, robust design, which pairs perfectly with a naturalistic minnow profile that provides a wonderful topwater silhouette, and it’s built with VMC black nickel hooks, which provide a great quality hold, and plenty of staying power. This 1.5-inch model is complete with a small lip to encourage topwater splashing and natural motion, and it comes in over a half-dozen different colors and finishes. And at the low price, you can easily pick up a model suitable for any weather or water condition. This lure can be fished in just about any way you could want to fish a topwater lure – it’s very versatile, and can be used with steady retrieve methods, stop-and-go retrieval methods, or even more technical twitch/jerkbait methods. The light weight of this lure provides incredible reaction to angler motion, so this bait can respond quickly even to slight motions of the rod, which helps when you’re trying to create a natural topwater presentation. It’s a simple equation – stunning versatility meets very low cost, and you can bet any topwater fisherman worth his salt has got a Rapala Original in his tackle box. If walking action is your thing, you’re not going to want to miss out on the Rapala Skitter Walk 08 Fishing Lure. This lure is perfectly crafted for the Rapala® "Walk-the-Dog" Action known by anglers worldwide, with a weighted tail and off-kilter design perfectly suited to walking on the surface of the water. It’s also crafted with a natural silhouette, realistic eyes, and color options ranging from hyper-realistic to flashy golds, pinks, and neons that are sure to draw in predators, and the VMC SuperSharp hooks make sure that whatever grabs on stays on. Fish tend to strike this lure at one of two times – either right after it hits the water, or after you’ve started walking, pause, and resume. And this lure does walk brilliantly. It gives you just the right amount of natural motion, along with splashes and noise that perfectly imitates a wounded or struggling baitfish, and catches the attention of predatory fish from great distances. You’ll have the best results walking it in a relatively small area, and recasting often, as we find that this bait attracts strikes upon water-entry quite often indeed, so you’ll want to take advantage of that. If you feel like jerking something around, and nothing but a specialist will satisfy, the X-Rap Jerkbait XR10 lure is going to be just what the doctor ordered. Whether right at the surface, or at its max running depths of 3-8 feet, the X-Rap gives you unparalleled responsiveness and its heavy casting weight means you can really chuck it out there, even without too much extra rigging. It’s designed to sink to the appropriate depths with a side-to-side motion, and then suspend and roll to the side to trigger bites and to cause the internal rattlers to attract farther fish. Retrieval will cause the classic Rapala “wounded fish” side-to-side action that has made it a favorite of anglers worldwide. It’s an incredible shallow suspender and jerkbait, and if you’re looking for a more laid-back fishing style with less toss and retrieval, you certainly can’t go wrong with this lure. 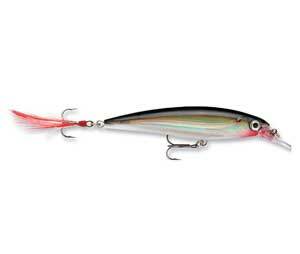 Rapala is probably most famous for their crankbaits, and the Rapala 1 ½ inch Ultra Light Minnow is no exception. This thing can really pull in fish, and its finely designed body combines with a small lip to create a unique wobble and rattle that is incredibly attractive to fish. It’s also designed for realism and attractiveness to fish, featuring almost a dozen colorways, all of which have external, raised scales and realistically painted eyes. The action is what you’re really going to love, though. This little lure is weighted enough to give it a pretty long cast on its own merits, though you may want to rig it up with some more weights if you’re going for a really long cast. And once you let it sink a bit and get it moving, it’s a delight to reel in, and the loud rattle from this crankbait combines with a quick, realistic presentation in the water which combines side-to-side movement with a quick wobbling action that draws in predatory fish from far and wide. If you’re in the market for an ultra-light crankbait, but want one with fully-featured performance, a long cast, and a great underwater presentation, you’re not going to want to miss out on the Ultra Light Minnow. 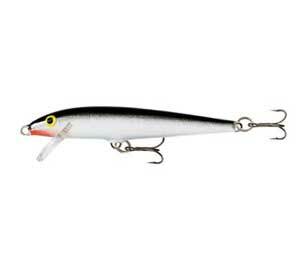 This Rapala Rattlin 05 is one of Rapala’s best and loudest. It features a specially designed BB chamber which creates a ton of noise, yet is still realistic and attractive to fish. It’s crafted with a dedication to realism, with holographic 3d eyes, exposed external scales, and a bunch of different colors. It’s designed to sink, and designed for long casts, and the balanced design always ensures a good profile and presentation when it’s sinking in the water, and when you need it most. It’s also incredibly versatile, with a realistic presentation and effective responsiveness at a huge variety of retrieval rates from extra-slow to as fast as you can crank your reel, and the lipless, compact design allow you to use it in areas where other lures might snag, such as in weedier waters, near rocks, or even during shore-fishing. Given its great presentation both during motion and while stationary, we recommend fishing this lure with a jerky retrieval method – toss it out as far as you can and let it sink for a while, then reel it in a bit, pause, reel it in a bit faster, pause, reel it in slower, and so on. Varying the speed and pausing every couple seconds allows the lure to move from a wobbling, stationary position to a more steady forward-facing fluttery swim, and causes a ton of noise from the finely-tuned BB chamber to attract your prey. 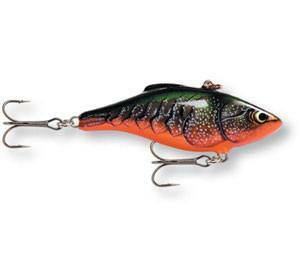 There’s a reason Rapala is renowned for its unique lipless crankbaits, and this Rapala Rattlin’ 05 is no exception. If you’re a crankbait lover, you owe it to yourself to try this lure out. It’s versatile effective, and above all… it’s fun to use! If you’re looking for a crankbait that’s a little more high-tech and natural, you may be interested in this Rapala Jointed 07, which has been designed for a neutral buoyancy, shallow-medium running depth, and an extremely long cast which combines with a loud rattle, realistic presentation, and straight-and-true retrieval action that makes this a pleasure to fish with if you’re looking for more of a swimbait experience. The natural presentation is aided by the jointed design, and it produces a very lively, baitfish-in-distress action that even the most stubborn and grizzled fish won’t be able to ignore for long. It’s also suited for super-slow retrieves, as the jointed body ensures a natural presentation even when you’re barely moving it – the water will push it around for you, and the smartly-jointed design and rattles will help do the rest – so it’s a great choice for anyone who doesn’t like casting and retrieving constantly, and is looking for more of a laid-back fishing experience. 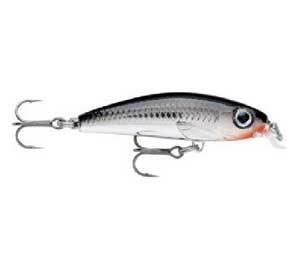 Rapala has remained one of the kings of high-quality lures for decades, and it seems unlikely that will change anytime soon. Their combination of experience, smart design, and high quality at a fairly low price point make them the go-to lure of tons of experienced anglers, and that’s because their lures get results. So whether you’re a rookie or a veteran, you should check out these lures, and give the rest of Rapala’s offerings a look. They’re not as cheap as your dime-store bait shop lures, and they’re not as expensive or cutting-edge as some of these johnny-come-lately lure companies, but they have endured the test of time, andfor a good reason. These lures work. What more could you want?